Now some may say those are noble causes, and some are and some are purely political. But the reason I am pointing this out is that this man who claims to be a Christian who not only leads 1.2 billion Catholics, he is also considered the leader of over a billion Protestants since June 26, 2000 when he was placed as the leader of the one world church of which all churches are members; expect of course the prophesied obedient remnant people. As is also very apparent, this Pope is seen by most of the 1.5 billion Muslims as a godly and trustworthy man to the point they openly salute on camera just as the Nazis did not too long ago. But did you notice? Not one time in his entire dissertation for 2018 did he mention the need to accept Jesus Christ as Lord and Saviour. In fact in his entire published address listed here on the Vatican website we see he only mentioned Jesus in passing ONE TIME! And he only used His name as a way to appeal to the flesh of those suffering disease or in open sin and he manipulated the usage of the Lord's name so as to make it appear as if Jesus was promoting ecumenicalism and the political hot button issues of his office known as the Universal Declaration of Human Rights; which by the way was mentioned ten times in the his dissertation. Five times in his actual address and five more times when it was referenced in the foot notes! In other words, He only mentioned Jesus one time in an ecumenical and political fashion, but promoted his Universal Declaration of Human Rights as the key means by which to better 2018. 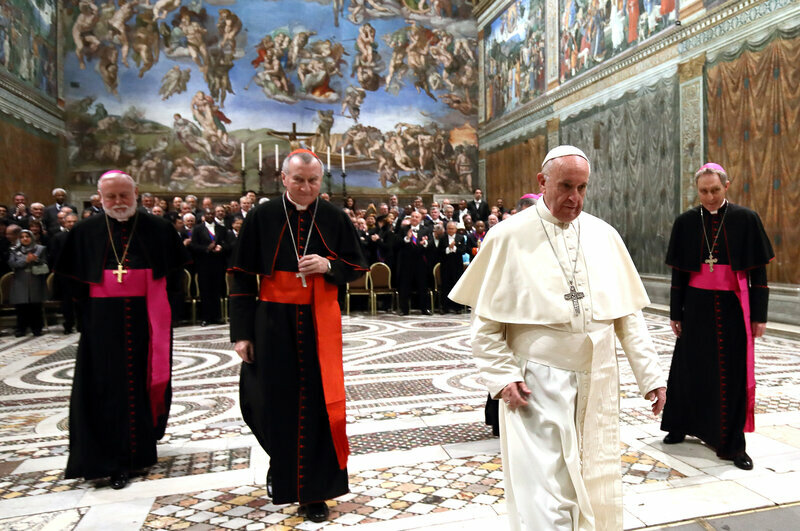 Can you imagine what the apostle Peter would have preached if he had an audience as big as these Popes do? One can see him declare 2 Chronicles 7:14 that says, "If my people, which are called by my name, shall humble themselves, and pray, and seek my face, and turn from their wicked ways; then will I hear from heaven, and will forgive their sin, and will heal their land." Sounds like something everyone alive can benefit by in 2018 doesn't it? Or what about when Peter stood up the very first day he had a small audience of men from many different nations as the Popes do daily? Peter didn't cower in fear thinking he may offend some in that crowd that heard him speak as this Jesuit Pope just openly did. In fact, Peter boldly stated in Acts 2:21 that "whosoever shall call on the name of the Lord shall be saved." But if the Pope said that on the world stage he would lose all of his political connections. Truth is Peter even spoke like that without the use of a bullet proof Pope mobile or an army of Vatican secret service clamoring around him to keep him safe. Peter knew the God of Heaven would protect him as long as he was in His will. But we all know the Popes do not worship the God of Heaven. Hence the reason for the bullet proof Pope mobile and armed guards nearby. As has been obvious for centuries, in the Vatican the need to uplift the creatures over and above the Creator has become apparent in how they promote hundreds of dead humans as living saints in marble; yet whenever you see an image of Jesus in Rome or any church Rome controls He is either hanging dead on a cross, sprawled out dead in the arms of His mother, as an infant during the Pagan festival of Saturnalia or He is standing in marble with His heart literally ripped from His chest as if He was just shot in the back. In all cases, the dead humans with the kneelers before their statues are suggesting you can pray to them for help. All of them look very much alive and appear able to answer your prayers. But the Creator of those humans is displayed by the Popes as either dead, in the act of dying or as an infant unable to do anything for you. By the way, it was also stated in Romans 1:22-25, "Professing themselves to be wise, they became fools, And changed the glory of the uncorruptible God into an image made like to corruptible man, and to birds, and fourfooted beasts, and creeping things. Wherefore God also gave them up to uncleanness through the lusts of their own hearts, to dishonour their own bodies between themselves: Who changed the truth of God into a lie, and worshipped and served the creature more than the Creator, who is blessed for ever. Amen." And yes, the homosexuality of the Popes and prelates is actually a fulfillment of the prophetic utterance in that passage as recompense for all that they have done to trample underfoot the written Word of God. Christian prophecy is THAT accurate!